Where did Martha Washington grow up? Martha Dandridge was born in the British colony of Virginia at her parents' home called Chestnut Grove Plantation. Her father, John Dandridge, was a successful farmer and local politician. Growing up, Martha was the oldest of eight children. When not helping to watch her younger siblings, Martha was learning homemaking skills including cooking, planting vegetables, and sewing clothes. Unlike many girls of her time, she also learned how to read and write. When Martha was seventeen she met a wealthy plantation owner named Daniel Parke Custis at church. Daniel was more than twenty years older than Martha, but they soon fell in love. In 1750, Daniel and Martha were married and Martha went to live with Daniel on his large estate. Martha quickly learned how to manage a much larger household. She had to host large parties and entertain important guests. This experience would help her out later when she was wife to the president. Martha and Daniel had four children together, although two of them died in childhood. Seven years after getting married, Daniel passed away. Martha was now a widow and owner of a huge Virginia plantation. Not long after her husband died, Martha met another plantation owner named George Washington. There was an immediate attraction and the couple soon agreed to marry. They had a large wedding at Martha's house on January 6, 1759. Martha and her two children then moved to Mount Vernon to live with George. When the Revolutionary War began, Martha's husband George was chosen to be commander of the Continental Army. Martha was celebrated by the patriots and hated by the loyalists. Many people feared that she would be kidnapped and used as leverage against her husband. Martha helped to manage the estate with her husband gone. She had experience doing this from when she was a widow. She also aided the cause of the patriots by raising money to help pay for things like uniforms and food for the soldiers. 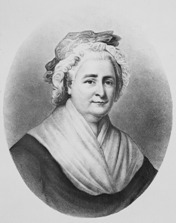 Martha gave over $20,000 of her own money to the war effort, which was a lot of money in the 1700s. During the war, Martha would travel to visit George at the Continental Army's winter camp. She spent the winter months working as George's secretary and entertaining important guests. Her presence helped to boost the morale of both her husband and the troops. Martha's trips to Valley Forge were a personal sacrifice. She could have stayed home on her nice estate at Mount Vernon, but she chose to support the troops. The camp was not only uncomfortable compared to home, but much more dangerous due to diseases such as smallpox. After the war, George Washington was elected the first President of the United States. Although the title wasn't used at the time, this made Martha the first "First Lady". She hosted events and started a tradition where she held public receptions every Friday. Martha did a great job as First Lady, but she quietly yearned for a more private life at Mount Vernon. When her husband refused to run for a third term, Martha was happy to return home. A few years after returning home, George Washington died. As per George's will, Martha freed the majority of his slaves a year later. She lived a quiet life after that and died on May 22, 1802. She was around 5 feet tall, more than a foot shorter than her six foot two inch tall husband. Her nickname was "Lady Washington." The plantation that Martha lived on with Daniel Custis was called the "White House" plantation. Martha and George didn't have children but raised Martha's children from her earlier marriage as well as two of their grandchildren after Martha's son died. Martha outlived all four of her children.